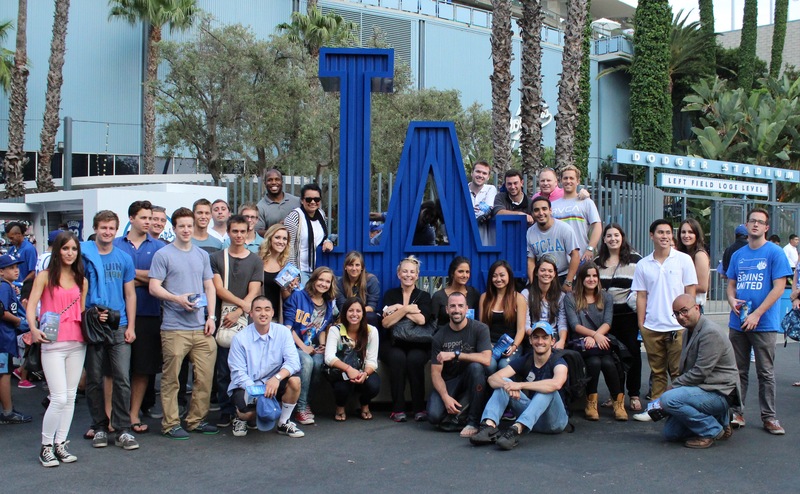 2015 UCLA Sports Business Program Ready to Go!! In what is slated to be the largest class in our history, students from around the globe will ascend i nto to Westwood on Monday, June 22 to begin their insightful journey into the exciting world of Sports Business. As in previous editions, students will be exposed to a variety of major topics facing the sports industry including; Sports Ethics, Sports Marketing & Sponsorship, Sports Law, Stadiums, Event Production & Management, Sports Broadcasting, Sport Sponsorship, Social Media in Sport as well as multiple facets related to the exploding field of Sports Technology. 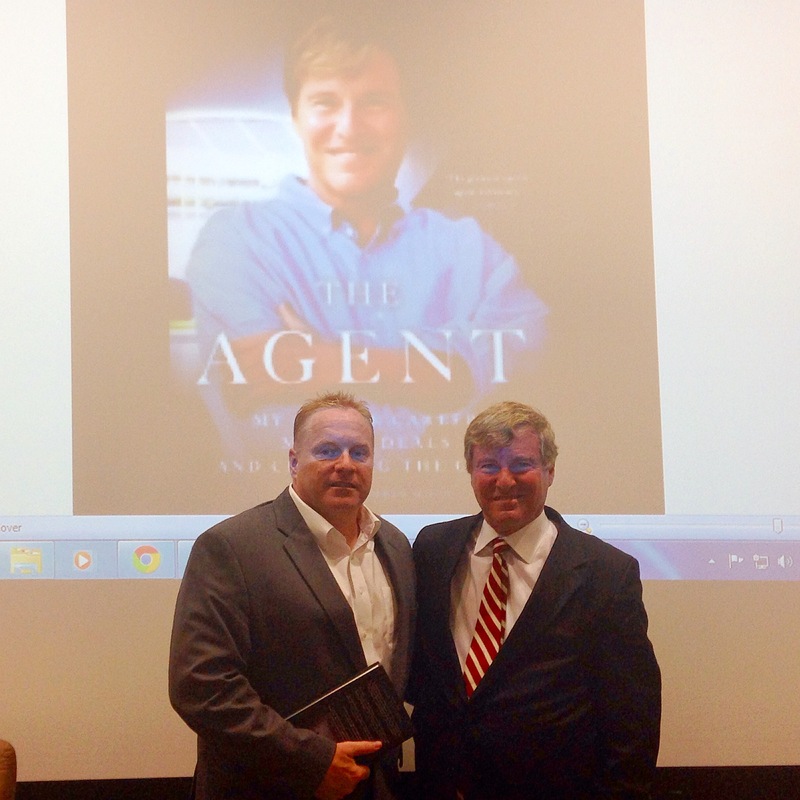 For several years, super sports agent Leigh Steinberg has been a featured guest speaker of the UCLA Sports Business Summer Institute. Every time he attends our program the students are impressed with his career and advice, as well as his great industry stories. During his 30-year career, Steinberg has represented over 150 professional athletes in football, baseball, basketball, boxing, and Olympic sports. He has countless stories that pertain to the sports business world including what kind of athletes he sought out to represent when he started out as an agent. Our students had a variety of questions for the popular sports agent. These questions encompassed everything from his thoughts on LeBron James and Carmelo Anthony’s decisions on the NBA free market, to his input on the Donald Sterling case. When asked about his movie/producing career, Mr. Steinberg laughed saying, “Jerry Maguire is always on… That’s a good thing.” If you haven’t seen the movie Jerry Maguire, it is based on Mr. Steinberg’s entry into the sports agent industry, starting with his number one pick in the NFL Draft. Mr. Steinberg also coached various actors and actresses on how to act like a football player, coach and/or owner in movies such as “Any Given Sunday” and “For the Love of the Game”. As a sports business guru and popular guest speaker, Mr. Steinberg left the students with practical and encouraging advice on how to enter the sports industry. Wasserman Media Group is a huge entity in the sports industry. They cover over 1200 athletes and negotiate deals for commercials, marketing promotions, athlete appearances and endorsement deals. Wasserman is a global company with around 300 employees. The class had the pleasure of Ted Yeschin, Senior Director of Business Development at Wasserman Media Group, as one of the week’s speakers. Mr. Yeschin has been very supportive of the sports program in previous years and the students always take away great insight into the sports industry after his candid presentations. Mr. Yeschin has many responsibilities at the Wasserman Media group, but a big part of his role is endorsement deals and athlete appearances. Some of the athletes he works with are basketball, baseball, football, soccer players and even retired broadcast personnel. Every student hopes they leave UCLA a step closer to that dream! Wednesday, Greg Issacs, Vice President of Digital Media for the National Football League (NFL) spoke to our students about his position with the NFL which includes digital marketing, technology management and business intelligence. 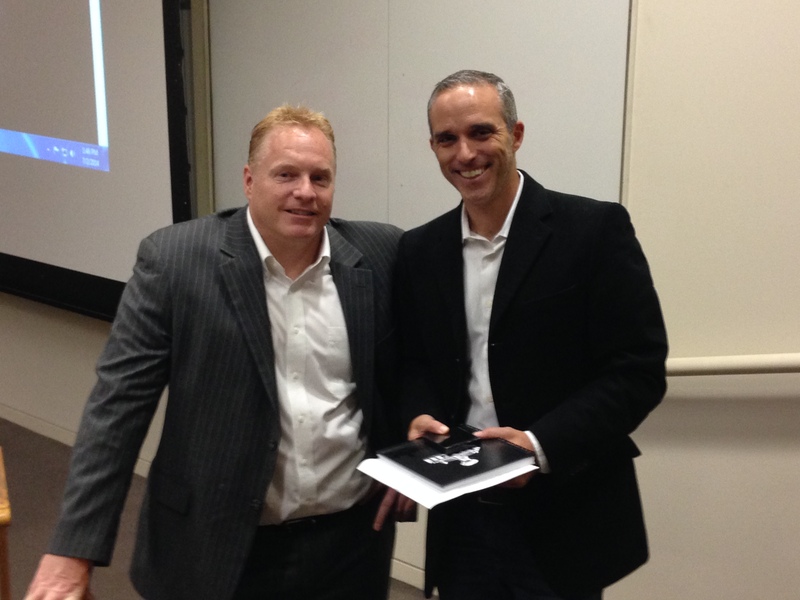 Mr. Issacs joined the NFL after serving as VP and GM at AT&T Interactive. Prior to AT&T, Mr. Issacs was a product manager at Vantage Media and LeadPoint, two early stage digital marketing companies. He began his digital career at eBay where he was the Director of eBay’s Developers Program and was responsible for making eBay the largest and most innovative web services platform. Mr. Issacs talked about growing the game internationally, including the NFL presenting three games in London this year. When a student asked if they planned to use current athletes in promotions to other countries, Mr. Issacs mentioned that Andrew Luck, of the Indianapolis Colts, filmed a commercial in German for the German fans. He also talked a lot about connectivity and keeping fans engaged all year round via media platforms. The students enjoyed hearing about how important digital media and marketing is to one of the largest sports leagues in the world – the NFL. Coming in fresh off a second Stanley Cup win in three years, our students had the pleasure of speaking to a few of the top-level executives of the Los Angeles Kings. Hockey Hall of Fame inductee Luc Robitaille, who is also the President of Business Operations and Alternative Governor talked to us about the difference of playing for a professional team and then transitioning to the business side of sports. The common theme amongst all three speakers was that in the last ten plus years, it has been amazing to see the change in the way the organization operates. They have worked hard to change the culture internally, but also gain fans, sponsorship and support from those living in Southern California. Josh Veilleux, VP, Corporate Partnerships, talked a lot about how much sponsorship has changed over the years. Sponsorship went from just having the sponsor’s name on a board, to creating a story or hockey related and branded content that is appealing to fans. Examples you can see around Staples Center include Waste Management’s recycling videos with Kobe, Matt Greene and other athletes that play at Staples Center. Additionally, with the teams growing success, making the Western Conference Finals 3 years in a row, and winning two Stanley Cups in those three years, their offseason is shortened drastically. They have a tighter turn around between seasons to get renewed sponsorship deals and marketing plans set in motion for a new season. Mr. Veilleux also mentioned how sponsorship is an ongoing learning process. The Kings organization continuously looks at other sports organizations both domestically and internationally to see how they can continue to grow sponsorship with new and innovative ideas. Lastly, James Cefaly, Senior Director, Fan Development and Community Relations spoke about working in the local community to grow hockey and fans. The Los Angeles Kings partnered with CCM/Reebok and Hockey Monkey, and started a program called Lil’ Kings. This program allows boys and girls, ages 4-8, to learn the sport of ice hockey for the first time and received free equipment. These efforts are what helps the sport grow in California, along with the efforts of rival SoCal team, Anaheim Ducks. Both teams have worked hard to make hockey one of the premiere sports in a difficult California market. Overall, the students were impressed with the speaker’s information about a successful sports team in the Los Angeles area. 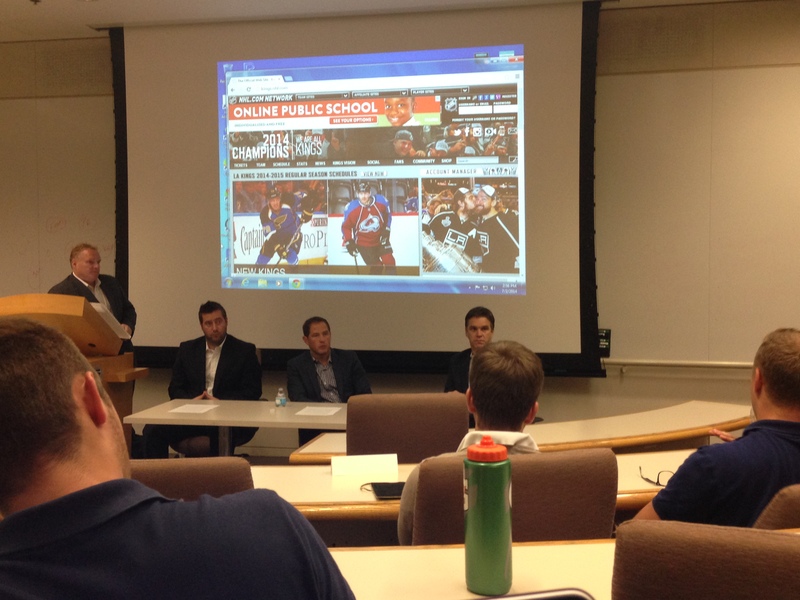 We are very thankful that Mr. Robitaille, Mr. Veilleux and Mr. Cefaly took the time to come in and speak to our sports business class where students were able to see the challenges some sports teams can face in diluted, busy sports markets. 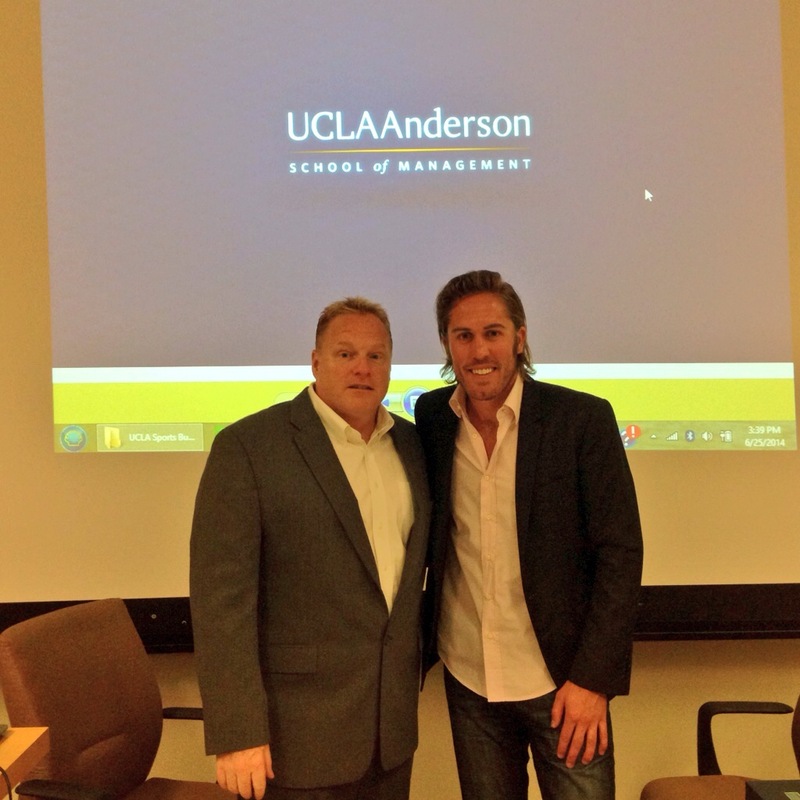 Wednesday, June 25th the UCLA Anderson Sports Business class had the honor of having Mr. Hoversten come in and speak to the class. Prior to joining the LA KISS, Hoversten oversaw business development for the Los Angeles Dodgers for four years and was tasked with increasing the team’s revenue streams. Under Hoversten’s leadership, the Dodgers set new revenue records year-over-year in addition to implementing first-ever brand entitlement and activation spaces at Dodger Stadium including the United Club Suites, Lexus Dugout Club and Ketel One Lounge. Prior to his work with the Los Angeles Dodgers, Hoversten served as VP of Business Development for the Colorado Crush Arena League Football Team for four years, overseeing all aspects of the team’s business operations including ticketing, sponsorship, game day operations, marketing and promotions. LA KISS has some help from Gene Simmons and Paul Stanley. Since KISS is their brand, they take pride in making sure that all aspects related to the brand and the experience comes through during games. Gene and Paul are at every home game and sitting in the stands. Another reason LA KISS appeals to fans, and gaining fans is that they have their players stay thirty minutes after games signing autographs. After hearing Schuyler speak about the LA KISS and what they envision for their team/business, we wouldn’t be surprised if other AFL teams follow the same business model. First Week of Sports Business in the Books!! Monday was the first day of our Sports Business program. Our students chose which internship they wanted to enroll in. Throughout this week we had meetings set up with the internship directors. 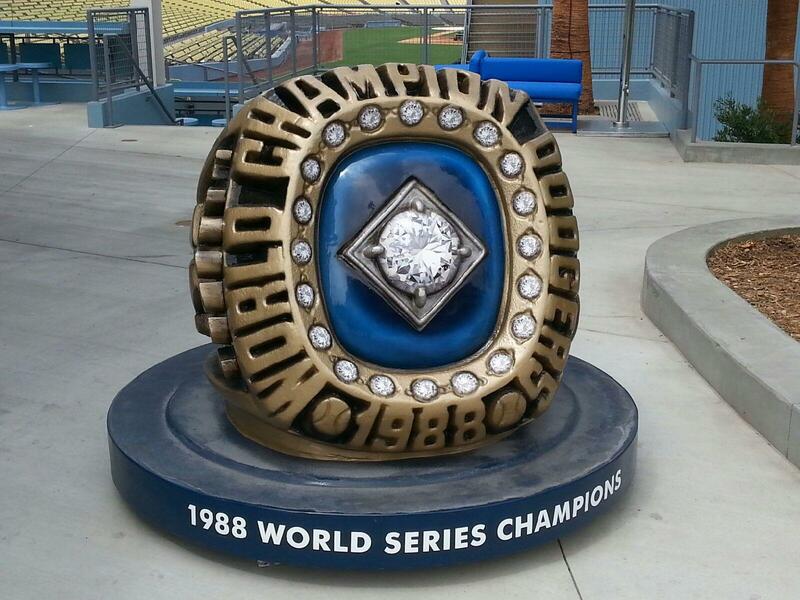 Tuesday Morning we went up to the Ravine and got a tour of Dodger Stadium. A few of the highlights included walking through the trophy showcase where we were able to see replicas of the World Series Trophies and Golden Glove winners. 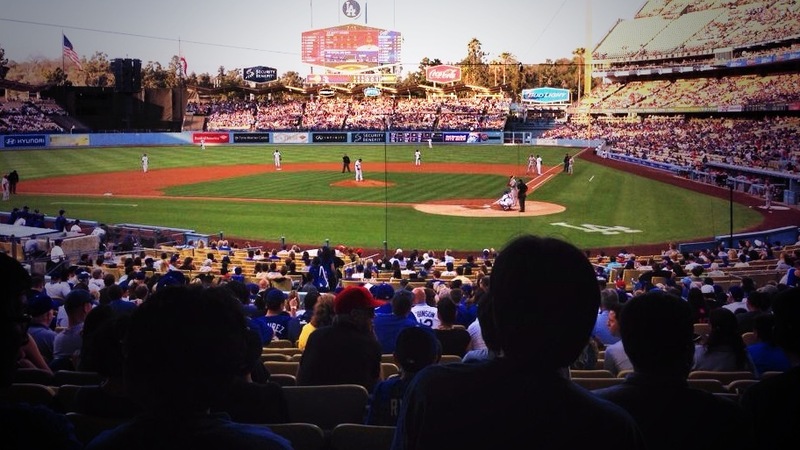 Each step of our tour we got deeper and deeper into the more exclusive parts of Dodger Stadium. We walked through the Dodgers post-game interview room, which was redone recently with all new screens that will enable advertising and sponsor logos to be interchanged throughout events. 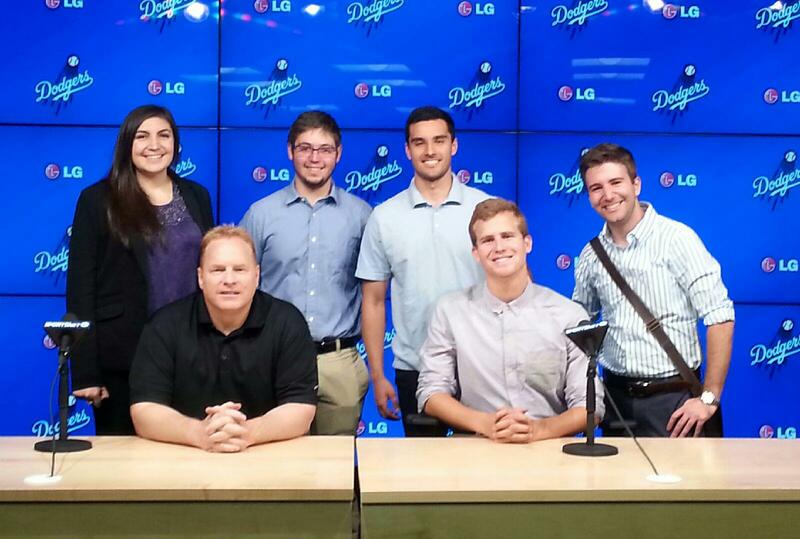 The most exciting thing on our tour was being able to walk through the Dodger clubhouse. Since the Dodgers are in season, we were not allowed to take pictures inside due to the privacy of the room. Adam, a Dodger front office employee told us that the Dodgers try to make the clubhouse as personal for the players as possible. It was surreal walking in there and standing inches away from Puig’s jersey, bat and cleats. Tuesday afternoon was our meeting with MPE for the Asics World Series of Beach Volleyball. This internship will be a great hands-on experience touching base in almost every business aspect from social media, finance, game presentation, and marketing. The team that our students will be working for includes former Olympic athlete Angie Akers, a former Boston College Volleyball player, a “2013 Anderson Sports Business Graduate,” as well as an all-star businesswoman who has worked for the NBA and other various national brands/events. The event runs from July 22nd – July 27th in Long Beach. Thursday afternoon the students met with Ms. Angleton at the LA Sports Arena and Coliseum. Students will be working on digitizing the promotional efforts and setting up social media platforms. 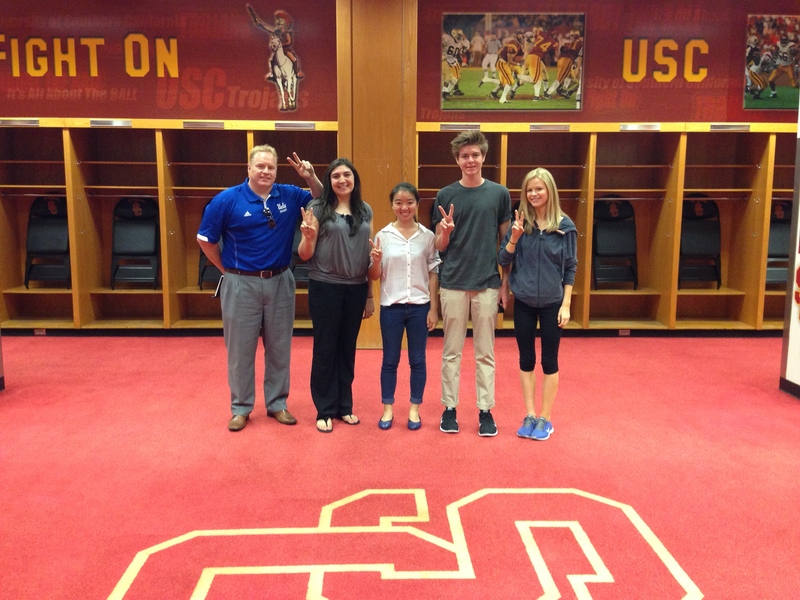 During the meeting, students got a tour of the LA Coliseum, USC football field recruitment room, locker room and other athletic facilities. Friday our students that chose the LA Galaxy internship met with their internship coordinator. The newly name changed Stubhub Center is home of the Los Angeles Galaxy and Chivas. Our students will focus on two main projects: corporate accounts, and support groups. 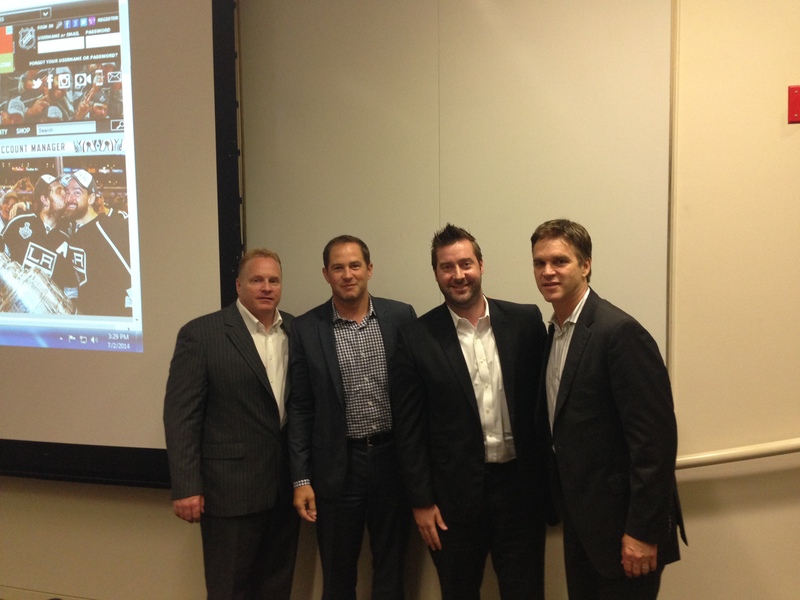 These projects will be challenging but provide great insight into the LA Galaxy organization. Overall this year’s internships will be very educational and exciting for all of our students. On Monday, June 23, 2014 students from around the world will embark on a once in a lifetime opportunity to study and work in the exciting world of Sports Business at the UCLA Anderson School of Management’s Center for Managing Enterprise in Media, Entertainment and Sports. As in previous years, students will be exposed to an extensive curriculum featuring major topics in the sports industry including Sports Marketing, Sports Law, Ethics, Stadiums, Economics, Event Management, Sports Agents, Broadcasting, Social Media in Sport as well as an exciting new section on Sports Technology which will focus on the exciting developments in new fan engagement technologies. As in previous years students will also be involved in intensive internship projects with numerous major sports organizations in Southern California hi-lighted by the LA Dodgers, LA Galaxy, UCLA Athletics, LA Memorial Coliseum & Sports Arena, LA 2015 World Special Olympic Games, LA KISS (AFL), and the World Beach Volleyball Championship with Management Plus Entertainment. As an added bonus students will also be provided the opportunity to attend the 2014 ESPY Awards at LA’s famed Nokia Theater and the international soccer friendly between Manchester United and the LA Galaxy at the Rose Bowl. 2014 is upon us and with it comes continued intensive discussion among stadium/team owners about what to do about the high fan demand for a comprehensive Wi-Fi solution in their respective venues. Currently, the vast majority of sports and entertainment venues both in North America and abroad do not provide Wi-Fi for their fans and it is having a negative effect on attendance and revenue. Studies out of both the SEC and BIG 10 indicate that there is a direct link between declining attendance and the lack of stadium Wi-Fi while the NFL’s attendance figures have declined steadily since 2007. Even more alarming is that the most significant drop in sports attendance can be seen in the ever-important 18-24 demographic and primary research clearly indicates the lack of Stadium Wi-Fi as the major contributing factor. While there are a number of additional factors that have contributed to these attendance issues, including the vastly improved quality of the home-viewing experience, the reality is that today’s fans are extremely tech savvy and want to be connected wherever they go. This desire translates to all of their activities, especially attending sporting events, and their inability to do so is having a significant negative impact on their fan experience, not to mention the revenue that the teams could potentially garner from them. 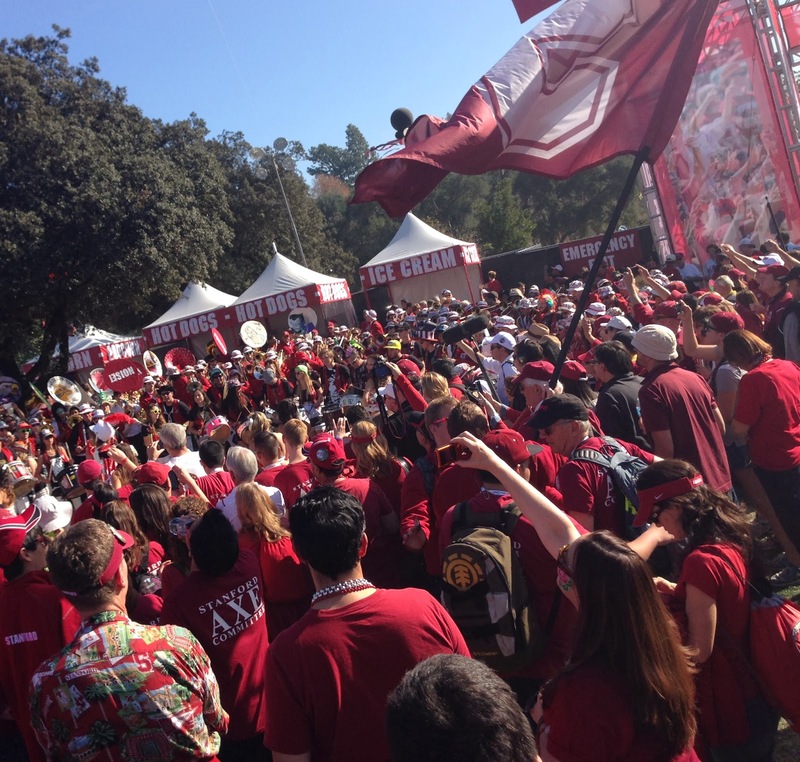 Sports fans in 2014 are arguably the most passionate group of brand ambassadors in any industry. They want to associate themselves with their favorite teams and share every unique experience about them that they can, yet the lack of stadium Wi-Fi actually prevents them from doing so. While Stadium/team owners are now starting to understand the need to address this important issue, they continue to look at the cost of doing so only as a hard cost. Why not look at it from a revenue and brand-building perspective? A solution lies in the application of updated hardware and software that can quantify and qualify user activities. The reality is that an investment in stadium Wi-Fi hardware will allow stadium/team owners to meet fans’ demand for the technology and simultaneously open a whole new range of revenue streams that are driven by their fans’ social interaction activities. And now, through the development of relevant software solutions, it’s possible to go beyond the traditional likes and impressions to leverage a fan base’s passion for their team(s) by tracking, incentivizing, measuring and monetizing all of their social activities while at the same time providing sports organizations with the ever-important marketing data on all of their fans. In short, it is imperative that sports organizations continue to push the envelope when it comes to delivering on their fan experience promise and in 2014, this means responding to the fan’s demand to be connected. Doing so will enable sports organizations to provide a true 360 degree fan experience, leverage the immense level of passion fans have for their teams and drive significant new revenue and brand awareness for the respective organizations. Do you think increased availability of Wi-Fi at sporting venues will improve the overall fan experience? Let us know your thoughts in the comments below.